Habit: Subshrub [annual, perennial herb]; strongly pungent-scented. Stem: erect. Leaf: simple, alternate or opposite; blade dotted with embedded oil glands. 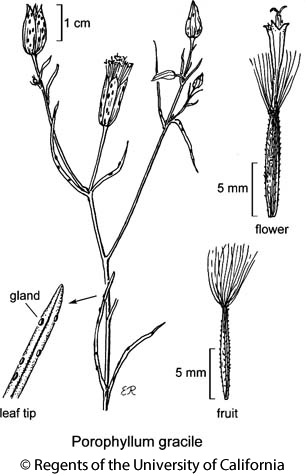 Inflorescence: heads discoid, peduncled, 1 or in +- leafy cyme-like clusters; involucre +- cylindric; phyllaries in 1 series, equal, free or fused at base, gland-dotted; receptacle flat, epaleate. Flower: corolla white to green-yellow or purple; style branches long, slender. Fruit: cylindric; pappus bristles 25--50+. Species In Genus: +- 30 species: North America, South America. Etymology: (Greek: pore-leaf, from gland-dotted leaves) Note: Porophyllum ruderale (Jacq.) Cass. var. macrocephalum (DC.) Cronquist (annual, leaves narrowly elliptic to ovate or obovate) collected as an agricultural weed in Seal Beach, Orange Co. (SCo). Stem: 1--many, 3--7 dm, glaucous, glabrous; branches slender, ascending. Leaf: 1--5 cm, entire, glaucous. Inflorescence: heads 1--few; peduncle slender; phyllaries 5, free, 10--16 mm, oblong, glaucous, dotted or streaked with glands. Flower: 20--30; corolla 7--9 mm, +- purple or +- white. Fruit: 8--10 mm; pappus 6--7 mm, dull white to +- brown. Chromosomes: 2n=48. Citation for this treatment: David J. Keil 2012, Porophyllum gracile, in Jepson Flora Project (eds.) Jepson eFlora, http://ucjeps.berkeley.edu/eflora/eflora_display.php?tid=4446, accessed on April 20, 2019.